There’s no shortage of winter squash in my diet at this time of year (at any time of year, actually), but I tend to eat the same ones over and over again: butternut, delicata, kabocha. I forget about good ‘ole acorn squash, which is actually the first winter squash I ever tried. 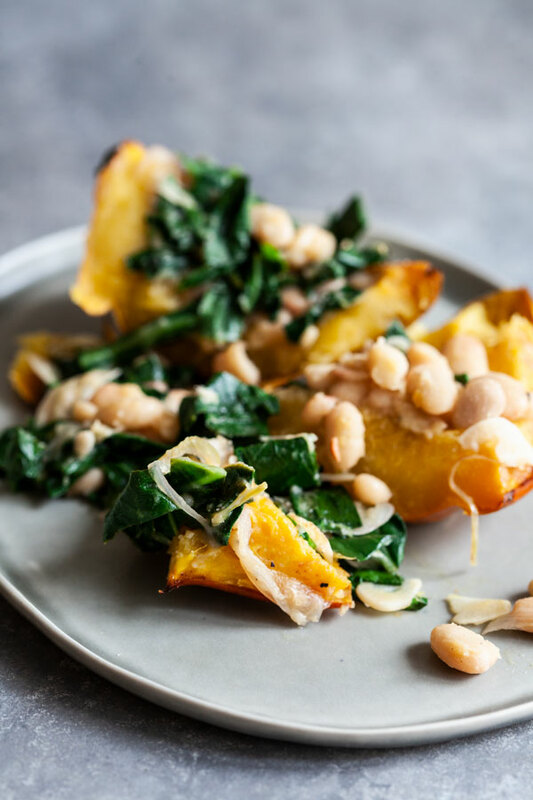 This week, I saw some adorable, petite acorn squash—each the perfect size for one person—at my health food store, and I figured it was time to revisit this too-long overlooked vegetable. I’m so glad I did. 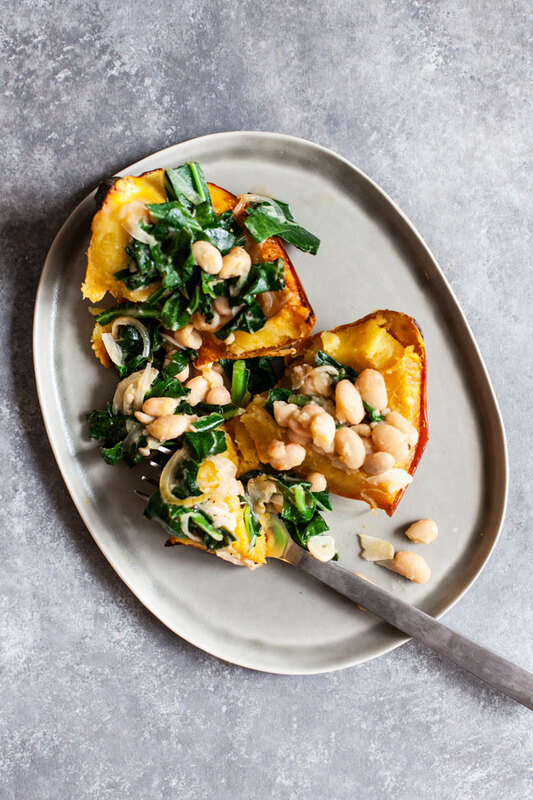 This stuffed acorn squash with garlicky beans and greens is a new, easy option for wintery weekend batch cooking. Cooking the squash for the recipe takes a little time: forty-five minutes, give or take. But it’s a totally hands-off process, and while the squash is roasting up nicely, you can prepare the beans and greens, which is really just a matter of minutes. 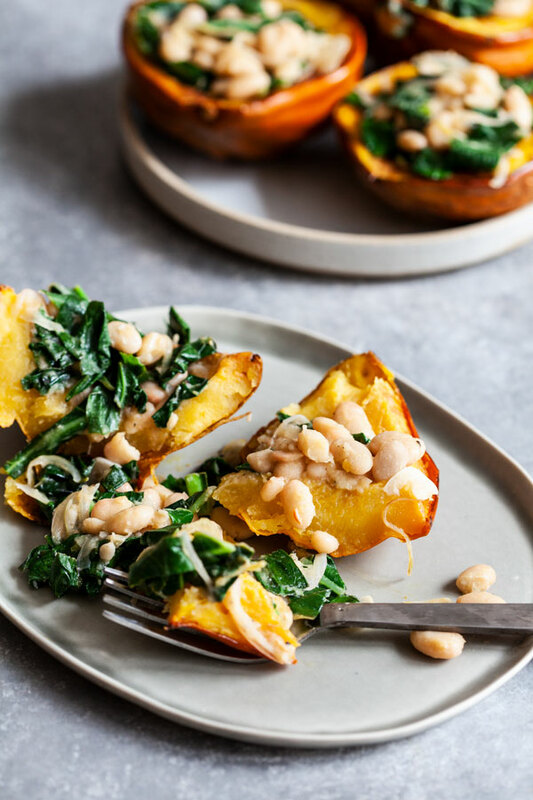 Once the ingredients are ready, you can stuff the squash and enjoy them right away for a dinner that looks deceptively fancy, given how simply it comes together. Or, if you’re doing the batch cooking thing, you can store the squash and beans separately for instant weeknight meals. I actually stuffed mine on the spot and placed them in a large glasslock container, which worked just fine. As is the case with most of the recipes I’ve been making during my internship, this one is flexible. I used collards and Great Northern beans, but chickpeas, navy beans, and even lentils would be perfect in the filling, and the greens are variable as well. I can’t wait to try this with broccoli rabe, which is a personal favorite! And while the acorn squash I got were the very ingredient that inspired this dish, it would be pretty awesome with delicata squash, too. 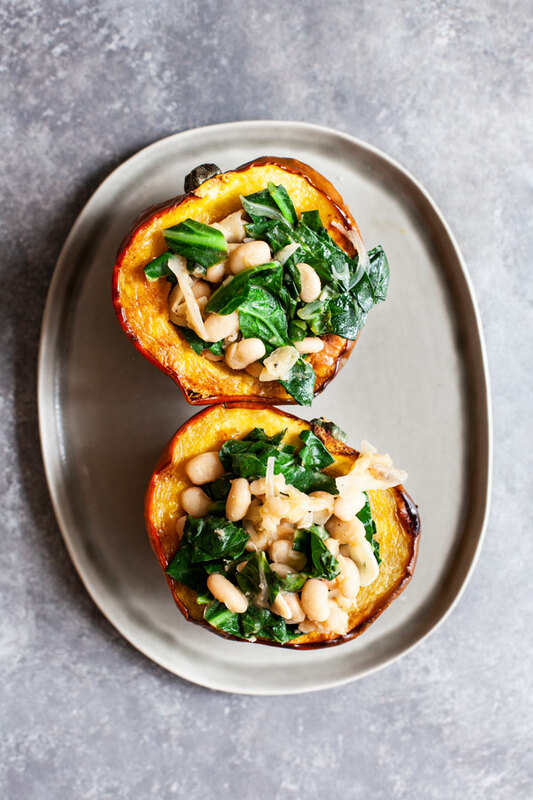 A hearty, nutritious stuffed acorn squash dish that looks fancy, but comes together with minimal work! 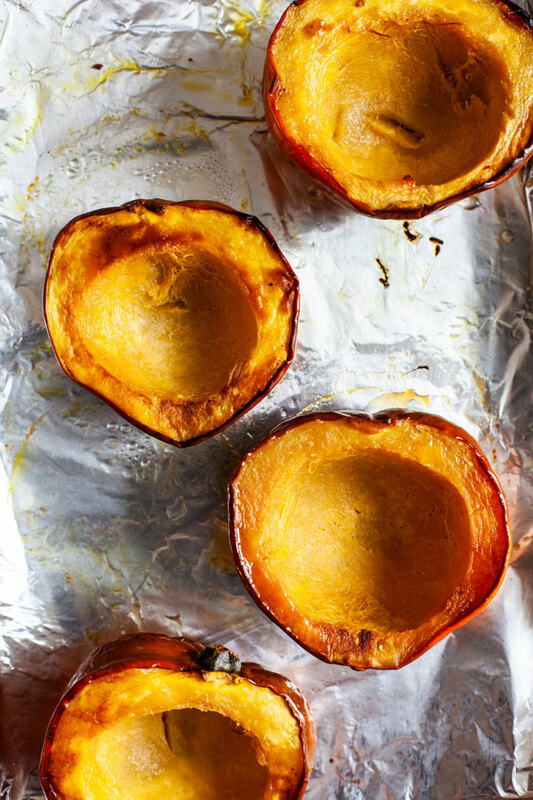 Preheat your oven to 375 F. Place the squash, cut side up, in a foil or parchment lined baking dish. Spray the squash on both sides with your oil spray, or use your hands to lightly rub/coat the squash with your cooking oil. Bake for 40-45 minutes, or until the edges of the squash are golden and the squash is tender when pierced with a fork. While the squash cooks, heat the oil in a large, roomy skillet over medium heat. Add the shallots and garlic. Cook for 3 minutes, or until the shallots are tender and clear. Stir in the beans. Next, stir in the collard greens. Cook, stirring often, until the collard greens are tender (about 5 minutes). Add the lemon juice and salt and pepper. Taste and adjust seasoning as desired. To serve, stuff each squash half with the bean mixture. Top with a sprinkle of vegan parmesan, if desired. Enjoy this pretty, yet easy dinner, friends. And thank you so very much for the lovely, wise comments on last Sunday’s post. I’ve been sitting with them and feeling grateful for all of you, which is a pretty excellent place to be in as we head into NEDA week 2019! I don’t have quite as many posts lined up as I did last year (#DIproblems), but as always, I have some words and feelings to share, straight from the heart.